Laura Dorwart is an Ohio-based writer who shares today's guest article about a unique small business marketplace in Akron. The Furnace Street space in Akron’s Northside District, billed as a “shop/eat/chill” haven for Akronites, opened on Black Friday in 2017 with support from the Knight Foundation and local investors. 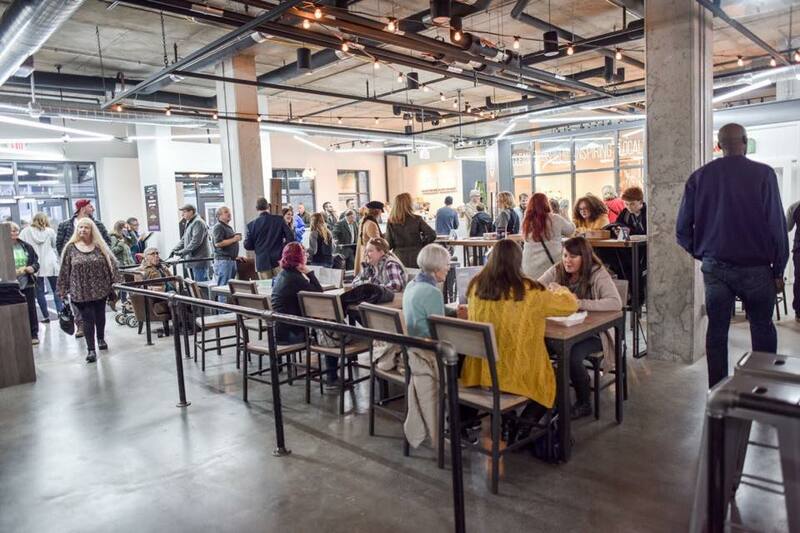 The mixed-use venue caters to an urban millennial customer base and now provides storefronts to nearly 40 vendors selling specialty goods, locally sourced food, and unique handcrafted items. Current vendors range from Akron Honey to art and jewelry from Poodle Skirt Studio, custom apparel at Rubber City Clothing, bicycle sales and repair at Dirty River Bicycle Works, and jam and jellies sourced from local farms at Jimmy’s Jam. Testa describes it as a retail and dining destination with all the amenities of a mall, albeit with an urban flair, more opportunities for social interaction, and more eclectic food options, including vegan, paleo, and gluten-free treats. And people venture out of their enclaves and get a little brave for two things, according to Testa: good food and drink, and community. “People will drive 30-40 minutes away, or even further, for quality food,” he says. Once they’re in an urban area, they look for walkable services and retail. That’s why half of the Northside Marketplace is devoted to social lounge. The Marketplace has a relaxing, coffee shop atmosphere during the day and buzzes with nightlife energy (and free-flowing drinks) in the evenings. As for quality food and beverages, the Marketplace has it in spades, starting with coffee at Sure House Roasting Co., local beers and bites at Local Brew, and wine, champagne, meats, and cheeses at Belle Vie. The idea for the Marketplace came into being when Testa noticed that local food purveyors and artisans — busy with family obligations, limited schedules, day jobs, and financial need — were often forced to run their businesses out of their guest bedrooms in their spare time. These limitations of daily life formed the basis of the idea for a marketplace format, where local vendors’ specialty items could be sold in one collective space even when the owners are at their 9-to-5s or driving kids to soccer practice. The biggest benefit of Northside Marketplace, both its developers and vendors say, is the community and guidance it provides to businesses who need a leg up. The Marketplace serves as a breeding ground for businesses just starting out and a permanent home for those who want it, in addition to providing opportunities for mentorship from established business leaders. So, building on the Marketplace’s success, what’s Testa’s vision for Akron’s future? Akron has already been pegged as a site of major growth potential by the eBay Retail Revival Program, which seeks to revitalize local businesses and has partnered with the city of Akron to create more meaningful retail experiences. Testa believes that Northside Marketplace could serve as a model for other cities looking to retain talent, grow small business, and build revenue. And rather than trying to beat mass distributors at their own game, Northside Marketplace vendors have succeeded by providing what no bigtime retailer can do: community, local products that you can’t find anywhere else, and the opportunity to be part of a homegrown, grassroots effort. Akron’s Northside Marketplace is open daily and is located at 21 Furnace Street.